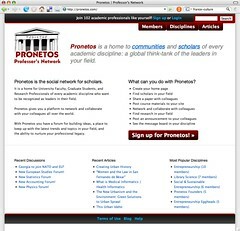 Pronetos, professor’s network | bibliothecaire ? Michel: Thanks for posting about us! I hope that readers will find Pronetos useful. Pronetos is a home to all academic communities. We offer repository services, and after the first of the year will offer a unique slate of publication tools – all Open Access, of course.